Zucchini are vegetables that very helpful to our health. They are low in calories and rich in minerals, typical of summer vegetables. For the first week of September, I’d like to propose that fall starts out with a delicious bite of summer. Zucchini are an essential element in preparing a healthy meal in no time. Zucchini can also be enjoyed raw, grated, and dressed like a salad. The frittata in this recipe was made one evening when we returned home very late and I had little time to prepare dinner. A saw basket of zucchini that my daughter-in-law had picked from our garden and it gave me the idea to make this dish. In a bowl, grate (a cheese grater will do) the zucchini and onion. Add the parmesan cheese, eggs, salt and pepper, and chopped basil leaves. Whisk to mix well. In a non-stick pan, heat the oil and when it becomes very hot, pour in the egg mixture and cover with a lid. After a few minutes lower the heat and continue cooking for 10 minutes. Check that you have formed a golden crust on the bottom. Using the cover, turn the frittata and let it sit so that it continues to cook through for another 10 minutes. 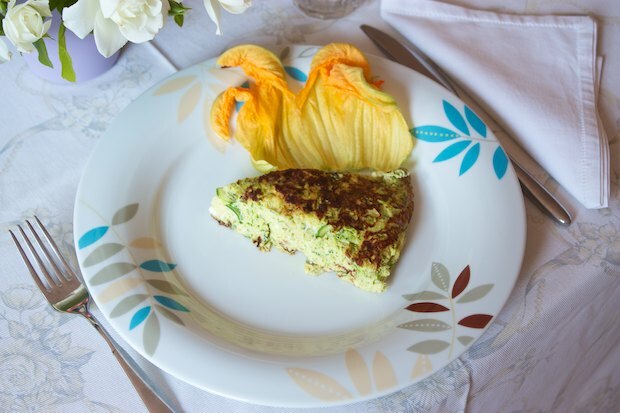 Posted in Eggs and tagged with Frittata di Zucchine, Frittata with Zucchini. RSS 2.0 feed.